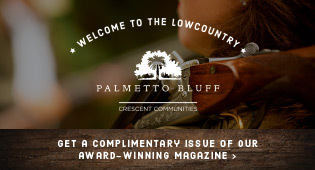 Hilton Head Magazines: CH2/CB2: Robert Irvine's Nosh and Eat! I had been waiting at Robert Irvine’s eat! for some time—waiting for its celebrity owner to arrive for our scheduled interview. From the back of the house, a silent alarm must have signaled that the famous chef had arrived. 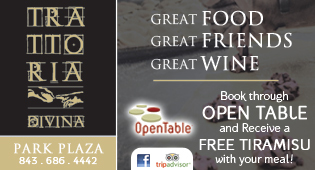 The already sharp and attentive staff picked up the pace during this hectic Tapas Tuesday, eat!’s weekly special where their entire tapas menu is half price, checking every last detail to ensure nothing had been missed. Irvine walked in with his face buried in his phone, most likely replying to a tweet or an e-mail from a fan. He sat down next to me, seemingly unaware of my presence until he had finished the last thread of his communication. He then turned his attention squarely on me and blurted, “Did you eat?” I had hardly gotten the “n” pronounced in my response before he hopped up and dashed to the kitchen to order some food. “Hey!” he turned his attention a customer, obviously a regular, who approached him in the middle of my question. I waited while he discussed family and caught up. That person was immediately followed by a group of fans taking the opportunity for a quick hello and photo. Luckily for me, my first round of tapas, selected by Irvine, had arrived to keep me company. While he was pulled from the table by autograph requests and glad-handing, I enjoyed the delectable smoked chicken pizzetta with apple cream cheese, sundried tomatoes, blue cheese, and corn relish followed by the shrimp corn dog with honey sriracha aioli. I could have stopped with just that, but my server advised me that more was on the way. Irvine returned to find me awaiting my next course. “How was it?” he asked. After a unanimous, “Yes, Chef!” The chefs then busied themselves re-creating the dish to Irvine’s meticulous specifications. A server arrived to alert Irvine to another issue, and I was left to enjoy my scallops. Stuffed from my meal, exhausted from watching Irvine’s activities, and not having even asked my first question, I was close to calling it quits when Irvine apologized and invited me to come to his other restaurant, nosh, the next day, before it opened, to finish the interview. Opened this past January in the Tanger 2 Outlets in Bluffton, Robert Irvine’s nosh, features a much more laid-back menu than its gourmet predecessor, eat! Its comfort-driven dishes fit perfectly with the inviting setting that has been created with reclaimed wood and local art. 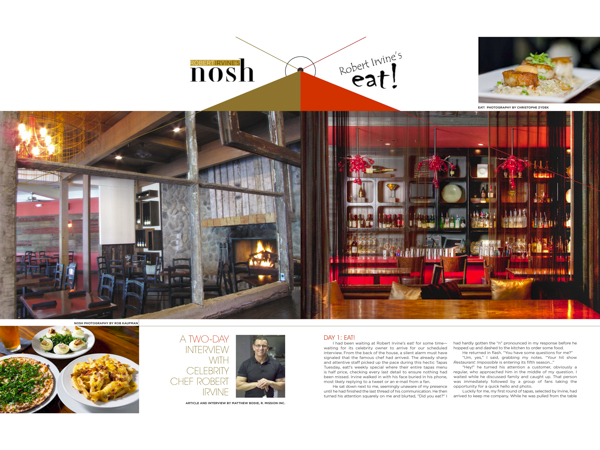 “Tom Bury, the construction manager from Restaurant: Impossible, did the redesign,” Irvine said of nosh’s décor. Restaurant: Impossible is anything like how he is in real life. He chuckled at my less than subtle reference to last night’s madness. I could see the parallel between what he was describing on the show and his behavior at eat! the previous night. With his schedule keeping him away so much, he has to make every moment count with his customers and staff. Nosh features a weekly burger and craft beer special every week alongside its regular menu of casual fare “done right.” As Irvine regaled me with stories of his past, I “noshed” on that week’s special, the German Brat Burger, an 8-oz. pork and beef bratwurst patty with black forest ham and caramelized onion cheese sauce on a toasted brioche bun. He told stories of joining the British Royal Navy at age 15 and eventually working his way up to serving aboard the Royal Yacht Britannia where the royal family regularly dined. He went on to describe how he was picked to be a part of a US Navy guest chef program and how that led to opportunities to work in the White House kitchens, feeding various American heads-of-state and even a few presidents. All of his 25 years in the kitchen led to landing the shows Dinner: Impossible, Worst Cooks in America, The Next Iron Chef, and Restaurant: Impossible. About to begin its fifth season, Restaurant: Impossible continues its successful run as one of the Food Network’s most popular shows. What, besides possessing the energy of a man half his age, has led to all of his success? “You will often see the mantra repeated throughout all of my shows, ‘Nothing is Impossible.’ This is so much more than just a catchphrase. This is my heartfelt philosophy which has driven me through all of my years,” Irvine said. With that, I decided it was best to end the interview. Word was leaked on Facebook and Twitter that Irvine had been spotted at nosh, and I assumed that my one-on-one time was drawing quickly to a close. One last note: with the holidays approaching, you can buy gift cards for your friends and family members both online and at the restaurants. You can also purchase official Robert Irvine merchandise from chefirvine.com/store. Robert Irvine’s nosh is located at 1414 Fording Island Rd., Unit B-160 in the Tanger 2 Outlet Center. For more information or reservations, call (843) 837-5765 or visit robertirvinesnosh.com. Nosh features a weekday happy hour from 4-7 p.m. with buy-1-get-1 free appetizers, $3 house liquor, and $2 Yuengling alongside their amazing seasonal craft beer selection. On Sundays, you can enjoy $6 burgers and $6 buckets of Pabst Blue Ribbon. Robert Irvine’s eat! is located at 1000 William Hilton Parkway, Suite B-6 in the Village at Wexford. 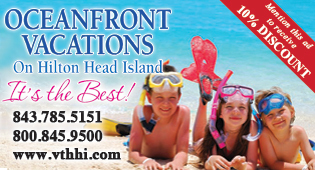 For more information or reservations, call (843) 785-4850 or visit eathhi.com. Eat! 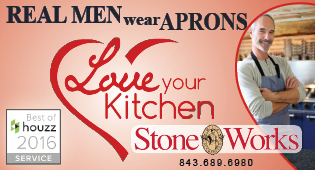 hosts a monthly cooking class/luncheon featuring three to four courses, wine, and a take-home recipe book.